Without a doubt the most successful hand grenade of the 20th Century, having the longest continuous service life of any other type. While it may not be an ideal design for most efficient function (offset detonator, causing asymmetrical fragmentation) it was simple, rugged and effective. The Mills Bomb is arguably the iconic example of a 20th century Hand Grenade. The history behind the "Mills Bomb" is rather involved, starting with the first concept patented by the Belgian Army in 1912 (The 'Roland Grenade'), evolving to the Mills Patent 'Grenade, Hand, No.5' in 1915. Production commenced swiftly with over 75 million Mills grenades manufactured between April 1915 and late 1918. 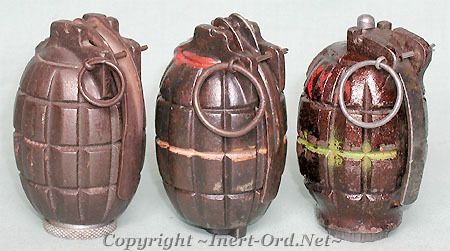 The No.36 Mk.I version was introduced at the end of WWI and remained the standard British fragmentation grenade until 1972. The Mills Bomb was in service for over 55 years. It has been copied by at least a half dozen other countries and was still in active foreign service (Pakistan) through the early 1980's. The term "Mills Bomb" was first coined early in WWI, as grenadiers were referred to as "bombers". The term was confusing and soon "grenade" was officially applied, but the old term continues to be used interchangeably. The Mill Bomb mechanism is functionally the same for the No.5, No.23 or No.36. 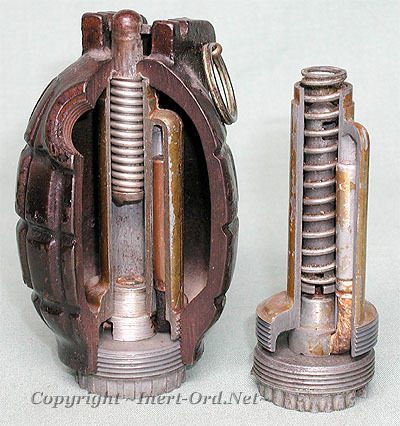 The "centrepiece" holds the fuze mechanism and detonator while providing a sealed chamber for the explosive, which is poured in through a fill plug on the top side. The fill plug and centrepiece threads are usually coated with a waterproof material to provide a weather tight seal. The fuze consists of a percussion cap, delay and detonator tube, crimped and formed into a 'U' shaped unit. Prior to use it was inserted into the base of the centrepiece and closed tight with a base plug. The grenade is designed with a strong coil spring which drives the striker. The striker is held in a cocked position by the safety lever. A safety pin locks the lever in place.